Interested in receiving a visual aid to interpret the Scrum Guide? 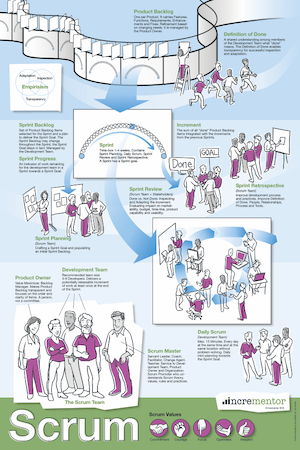 Grab a free copy of a very cool Scrum Poster and show off among your colleagues and friends. In the spirit of transparency, this poster can be a learning aid (for example when listening or reading the Scrum Guide) or a tool for Scrum Masters to explain Scrum to the organization, Product Owner or Development Team. Only one poster per person please. Currently shipping to US and Europe only. Due to higher volume, it might take a few days to fulfill, we will notify you by email once the poster has shipped.